CINCINNATI--(BUSINESS WIRE)--The Procter & Gamble Company (NYSE:PG) today reiterated the facts about its leading market share brands, winning total shareholder return and strong plans for continued value creation, setting the record straight regarding Trian’s flawed and outdated view of the Company. Ahead of the Company’s upcoming 2017 Annual Meeting of Shareholders, P&G strongly recommends that shareholders vote to support the P&G Board by voting the BLUE Proxy Card “FOR” ALL of P&G’s highly qualified Directors. Additional information regarding the proxy contest, as well as the Company’s strategy and recent results, is available at http://voteblue.pg.com. Over the past several weeks, the P&G team has been on the road meeting with shareholders. We have been highlighting the strategy and plans P&G is executing to create value for consumers and for all of P&G’s shareholders. P&G met or exceeded each of its going-in fiscal 2017 objectives: balanced top- and bottom-line growth, cash productivity and cash delivered to shareholders. Today’s P&G is well positioned with the right plan, the right structure and the right Board in place to deliver results and shareholder value for the short-, mid- and long-term. 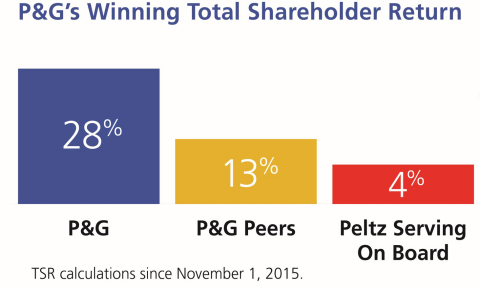 P&G is successfully executing a winning strategy and has strong momentum. We firmly believe now is not the time to risk derailing our progress by adding Trian’s Mr. Peltz to the P&G Board. P&G is simplifying its structure through one organizing principle: the business is run by category. Category leaders have complete ownership of the business from idea to sales execution and the bottom line. Prior to our transformation, we studied numerous organization designs, including one similar to what Mr. Peltz proposes. We concluded it would result in higher costs, lower efficiency, reduced profits, and an added layer of management complexity. Furthermore, we believe this proposal is code for another restructuring and a precursor to a breakup of the Company – his “cookie-cutter” activist plan. P&G’s productivity program is substantive and impactful. P&G over-delivered on its first $10 billion productivity goal and is well positioned to deliver up to $10 billion more in savings. This program overcame $7 billion in negative foreign exchange impacts. It enabled investment in R&D innovation, enhanced selling capabilities and increased sampling of superior products to new consumers. It increased profit per employee by 45%. It significantly increased our industry-leading margins, which we will continue to improve going forward. P&G’s noticeably superior innovation is meeting consumer needs and driving growth. We do more than simply study innovation, as suggested by Mr. Peltz. P&G’s innovation machine has delivered new brands such as Always Discreet and Unstopables; delivered blockbuster new sub-brands such as Tide PODS, Ariel PODS, Gain FLINGS, Pampers Pants, Always Radiant, and Oral-B Genius; and upgraded the superiority of entire brands such as Dawn, Fairy, Charmin, Bounty, Head & Shoulders, SK-II, Old Spice, and Vicks to sustain their market-leading growth. To suggest that P&G’s innovation machine is broken is ludicrous. P&G consistently dominates the IRI New Product Pacesetter rankings as the #1 company for successful new product innovations. P&G grew overall e-commerce sales at roughly a 30% rate last fiscal year. P&G grew share in eight out of 10 categories in e-commerce in the last fiscal year. P&G’s e-commerce sales are over $3 billion – more than our top two competitors combined. P&G is one of the leading advertisers in digital media, and our consistently strong digital and e-commerce efforts are winning across multiple brands with people in all life stages, including millennials. 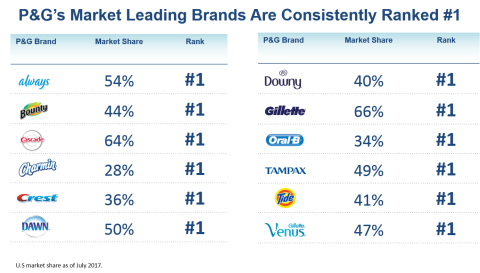 Among millennials, numerous top-selling P&G brands hold the #1 share position, and more than half have grown household penetration in the past year. P&G is on the right track. We’ve done our homework. Don’t let Mr. Peltz derail the progress we are making. Reject Mr. Peltz’s bid to get on your Board. P&G’s Board has significant leadership experience across a range of industries and geographies. While Mr. Peltz claims to have consumer packaged goods experience, his experience is limited to food and beverage companies – not household and personal care categories. We have done our homework. Mr. Peltz does not have the requisite skills nor the experiences we seek, and is not the right Director for P&G. The Board and management team have talked to numerous directors, CEOs and senior executives who have worked with Mr. Peltz, and positive recommendations were not forthcoming. Several people, however, would only speak candidly about their experiences with Mr. Peltz if those discussions were kept confidential, for fear of retribution. P&G people are working with passion, ownership and commitment to create value for consumers and for you – P&G shareholders. We never quit. We intend to win in the marketplace. We would have it no other way. Which is why the P&G Board, management team, and I continue to strongly believe it is in the best interest of our company—and all of us who care about P&G—to VOTE BLUE. On behalf of your Board of Directors, we thank you for your continued support. Your Board and management team strongly recommend shareholders vote “FOR” on the BLUE Proxy Card to support ALL of P&G’s nominees to the Board. Shareholders are urged NOT to use any white proxy card or voting instruction forms you might receive from Nelson Peltz of Trian and are strongly encouraged to simply disregard and discard the white proxy card. If you previously voted the Trian white proxy card, you have every proper and legal right to change your mind. You can change your vote by simply voting a new BLUE Proxy Card. Only your last dated proxy card will count. You can vote by Internet, telephone or by signing and dating the BLUE Proxy Card and mailing it in the postage paid envelope provided. If you have any questions about how to vote your shares, or need additional assistance, please contact our proxy solicitors, D.F. King & Co., Inc. at (877) 361-7966 or MacKenzie Partners, Inc. at (800) 322-2885. P&G notes that additional information regarding the proxy contest, as well as the Company’s strategy and recent results, is available at VoteBlue.PG.com. Certain statements in this release or presentation, other than purely historical information, including estimates, projections, statements relating to our business plans, objectives, and expected operating results, and the assumptions upon which those statements are based, are “forward-looking statements” within the meaning of the Private Securities Litigation Reform Act of 1995, Section 27A of the Securities Act of 1933 and Section 21E of the Securities Exchange Act of 1934. These forward-looking statements generally are identified by the words “believe,” “project,” “expect,” “anticipate,” “estimate,” “intend,” “strategy,” “future,” “opportunity,” “plan,” “may,” “should,” “will,” “would,” “will be,” “will continue,” “will likely result,” and similar expressions. Forward-looking statements are based on current expectations and assumptions, which are subject to risks and uncertainties that may cause results to differ materially from those expressed or implied in the forward-looking statements. We undertake no obligation to update or revise publicly any forward-looking statements, whether because of new information, future events or otherwise. Risks and uncertainties to which our forward-looking statements are subject include, without limitation: (1) the ability to successfully manage global financial risks, including foreign currency fluctuations, currency exchange or pricing controls and localized volatility; (2) the ability to successfully manage local, regional or global economic volatility, including reduced market growth rates, and to generate sufficient income and cash flow to allow the Company to affect the expected share repurchases and dividend payments; (3) the ability to manage disruptions in credit markets or changes to our credit rating; (4) the ability to maintain key manufacturing and supply arrangements (including execution of supply chain optimizations, and sole supplier and sole manufacturing plant arrangements) and to manage disruption of business due to factors outside of our control, such as natural disasters and acts of war or terrorism; (5) the ability to successfully manage cost fluctuations and pressures, including prices of commodity and raw materials, and costs of labor, transportation, energy, pension and healthcare; (6) the ability to stay on the leading edge of innovation, obtain necessary intellectual property protections and successfully respond to changing consumer habits and technological advances attained by, and patents granted to, competitors; (7) the ability to compete with our local and global competitors in new and existing sales channels, including by successfully responding to competitive factors such as prices, promotional incentives and trade terms for products; (8) the ability to manage and maintain key customer relationships; (9) the ability to protect our reputation and brand equity by successfully managing real or perceived issues, including concerns about safety, quality, ingredients, efficacy or similar matters that may arise; (10) the ability to successfully manage the financial, legal, reputational and operational risk associated with third party relationships, such as our suppliers, distributors, contractors and external business partners; (11) the ability to rely on and maintain key company and third party information technology systems, networks and services, and maintain the security and functionality of such systems, networks and services and the data contained therein; (12) the ability to successfully manage uncertainties related to changing political conditions (including the United Kingdom’s decision to leave the European Union) and potential implications such as exchange rate fluctuations and market contraction; (13) the ability to successfully manage regulatory and legal requirements and matters (including, without limitation, those laws and regulations involving product liability, intellectual property, antitrust, privacy, tax, environmental, and accounting and financial reporting) and to resolve pending matters within current estimates; (14) the ability to manage changes in applicable tax laws and regulations including maintaining our intended tax treatment of divestiture transactions; (15) the ability to successfully manage our ongoing acquisition, divestiture and joint venture activities, in each case to achieve the Company’s overall business strategy and financial objectives, without impacting the delivery of base business objectives; and (16) the ability to successfully achieve productivity improvements and cost savings and manage ongoing organizational changes, while successfully identifying, developing and retaining key employees, including in key growth markets where the availability of skilled or experienced employees may be limited. For additional information concerning factors that could cause actual results and events to differ materially from those projected herein, please refer to our most recent 10-K, 10-Q and 8-K reports. The Company has filed a definitive proxy statement on Schedule 14A and form of associated BLUE Proxy Card with the Securities and Exchange Commission (“SEC”) in connection with the solicitation of proxies for its 2017 Annual Meeting of Shareholders (the “Definitive Proxy Statement”). The Company, its directors and certain of its executive officers will be participants in the solicitation of proxies from shareholders in respect of the 2017 Annual Meeting. Information regarding the names of the Company’s directors and executive officers and their respective interests in the Company by security holdings or otherwise is set forth in the Definitive Proxy Statement. Details concerning the nominees of the Company’s Board of Directors for election at the 2017 Annual Meeting are included in the Definitive Proxy Statement. BEFORE MAKING ANY VOTING DECISION, INVESTORS AND SHAREHOLDERS OF THE COMPANY ARE URGED TO READ ALL RELEVANT DOCUMENTS FILED WITH OR FURNISHED TO THE SEC, INCLUDING THE COMPANY’S DEFINITIVE PROXY STATEMENT AND ANY SUPPLEMENTS THERETO AND ACCOMPANYING BLUE PROXY CARD, BECAUSE THEY WILL CONTAIN IMPORTANT INFORMATION. Shareholders may obtain a free copy of the Definitive Proxy Statement and other relevant documents that the Company files with the SEC from the SEC’s website at www.sec.gov or the Company’s website at http://www.pginvestor.com as soon as reasonably practicable after such materials are electronically filed with, or furnished to, the SEC. U.S. market share as of July 2017. TSR calculations since November 1, 2015. Market data as of September 6, 2017. The peers selected by Trian in its September 6, 2017 White Paper are as follows: Beiersdorf, Church & Dwight, Clorox, Colgate-Palmolive, Edgewell Personal Care, Henkel, Kimberly-Clark, L’Oreal, Reckitt Benckiser and Unilever. The TSR for “Peltz Serving on Board” is a weighted average based on the market capitalization of Madison Square Garden, Mondelez, Sysco and Wendy’s. The TSR for “P&G Peers” is a simple average, which follows the same methodology utilized by Trian in its measurement of the same peer constituency in its presentation filed with the SEC on September 6, 2017.2 TSR calculations since November 1, 2015. Market data as of September 6, 2017. The peers selected by Trian in its September 6, 2017 White Paper are as follows: Beiersdorf, Church & Dwight, Clorox, Colgate-Palmolive, Edgewell Personal Care, Henkel, Kimberly-Clark, L’Oreal, Reckitt Benckiser and Unilever. The TSR for “Peltz Serving on Board” is a weighted average based on the market capitalization of Madison Square Garden, Mondelez, Sysco and Wendy’s. The TSR for “P&G Peers” is a simple average, which follows the same methodology utilized by Trian in its measurement of the same peer constituency in its presentation filed with the SEC on September 6, 2017.